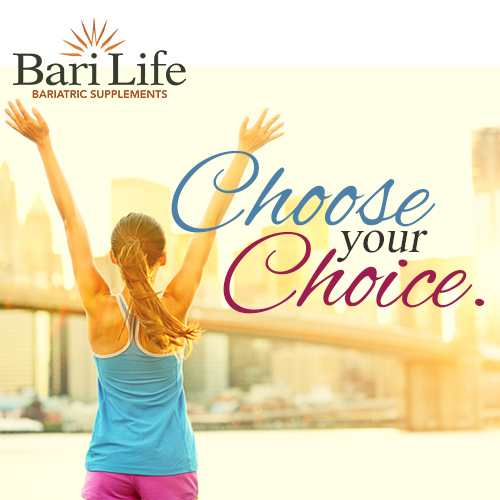 Bari Life Bariatric Vitamins and Supplements wants you to reach your health goals following bariatric surgery. Without a doubt, one key element to your weight loss journey is taking your bariatric vitamins and supplements. In addition, you have to make new choices to reach and maintain your goals. Changing your life can be hard. Humans are creatures of habit and when you decide to quit a habit, you can be left feeling overwhelmed, anxious, confused, and downright scared. Deciding to have weight loss surgery is one of the biggest and most important decisions you will ever make. And it may just be the best life-saving choice you will choose. After surgery, you will begin a new healthy life journey that includes vitamins and supplements, a healthy diet, and an exercise routine that will change as you become stronger and more active. Find a workout you enjoy – walking, yoga, resistance bands are great exercises that you can change up to stay energized. Stay hydrated – thirst sometimes masks itself as hunger, so stay hydrated to stave off false hunger pangs. Love your body – it’s the only one you’ve got and choosing to love the greatest gift you’ve been given will motivate you to keep it healthy. Charlotte York made a life-changing decision which, fueled by her friends’ initial reactions, unquestionably left her with a lot of self-doubt. However, she stuck by her decision and never looked back. She achieved her goals and found her true happiness. You have made the choice to get healthy. Taking your vitamins and supplements, maintaining a proper diet and exercise routine, and choosing to love your body today, tomorrow, and for the rest of your life will keep you focused on reaching your goals.